This is another coin collector game that's FANTASIC! The frog told me to GET. 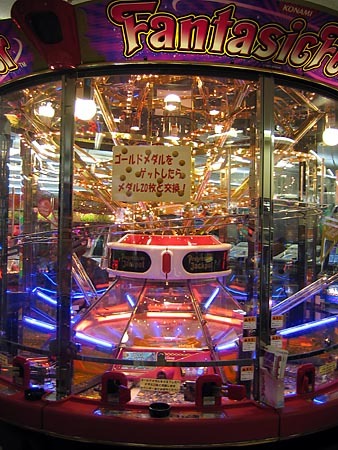 If you concentrate on the image, you can see by the reflection that we are stationed on the crane game floor. 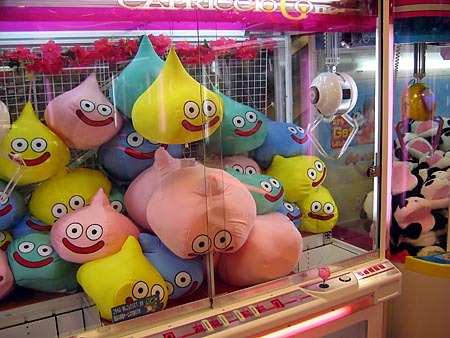 The crane games in Japan are much larger than the crane games in America. 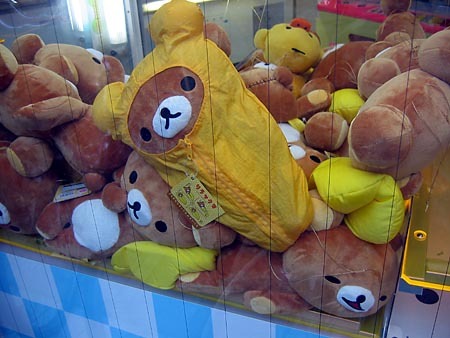 But just because the crane games are bigger doesn't mean more people are winning prizes. 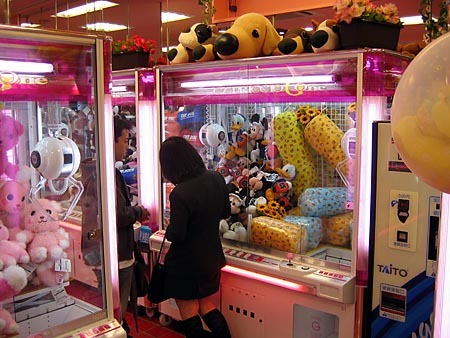 For the most part, it was easy to take photos of crane games because no one was playing them, save this rare couple who probably are on their first date and it's some sort of first date ritual that you never perform again because no one ever wins, in Japan, in the USA, in Micronesia. It's something everyone on the planet can agree on, it's something we all share. 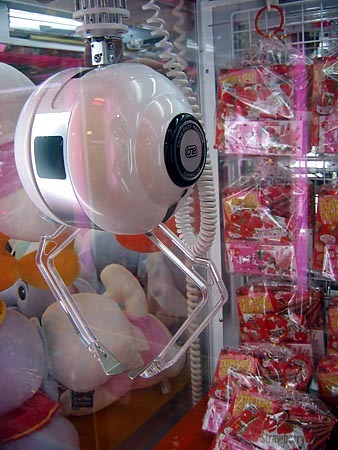 Here you can see a "close-up" of the grabber mechanism that sort of looks like a creepy autonomous ro-bot from a science fiction film and those plastic arms with the metal hands are the "spreaders." I'm scaring myself here. 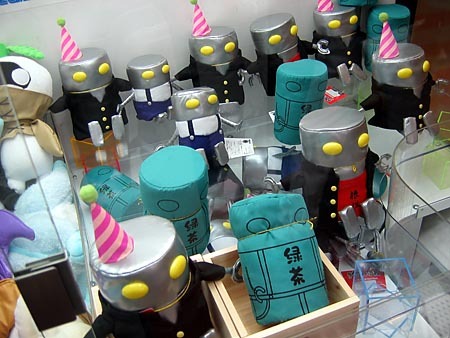 Happy acid rain drops, why do you mock spreader ro-bot with your delightful smiles? Go in the hole. Get in the hole already. 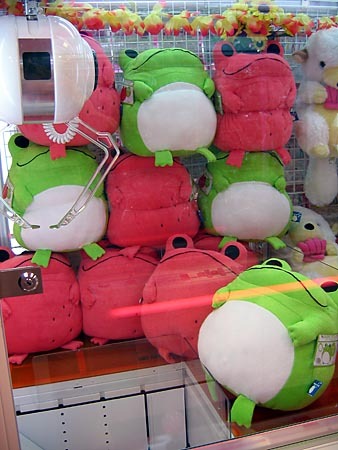 These frogs are crammed! 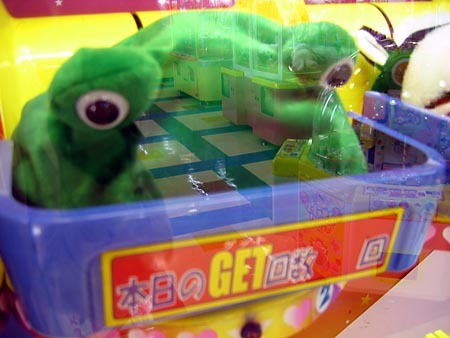 Notice also the clear plastic barrier to prevent you from just knocking a frog on the head and tipping it into the eager maw of the prize hole. Seriously dude, your new pajama sleeper thing is really nice, but if you don't get off me, I'm going to suffocate. DUDE.